In 2016, LibreOffice Conference will be hosted by the Faculty of Information Technology at Brno University of Technology, Czech Republic, and organized by OpenAlt, from September 7 to 9. The Document Foundation (TDF) announced LibreOffice 5.1.3, the third minor release of the LibreOffice 5.1 family, supporting Google Drive remote connectivity on GNU/Linux and MacOS X.
deployments, TDF suggests the “still” version: LibreOffice 5.0.6. LibreOffice 5.1.3 is available for download from http://www.libreoffice.org/download/libreoffice-fresh/. 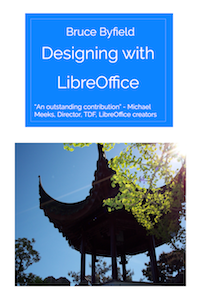 Bruce Byfield’s much-anticipated book, Designing with LibreOffice has been published by Friends of OpenDocument, Inc. Read about it here or jump straight to the download/buy page to get a free PDF or buy a printed copy. “Designing With LibreOffice” teaches everything you need to know about document production: chapters, footnotes, citations, indexes, outlines, cross-references, incorporating images and spreadsheets, and controlling the appearance of your documents. It is well-organized and contains abundant examples, and is suitable for beginners to wizened old pros, who will probably discover things about LibreOffice that they didn’t know. The LibreOffice Documentation Team has published Getting Started with LibreOffice 5.0. Free PDFs can be downloaded from The Document Foundation’s wiki. For US$10 LibreOffice-from-Collabora provides the enterprise-hardened productivity suite for business and public sector, including three years of maintenance updates. For those who don’t want or need the enterprise-level product, you can get LibreOffice Vanilla free here. The LibreOffice Vanilla app is almost identical to the latest copy of LibreOffice Fresh by Document Foundation contributors. It comes fresh from them, to you, after packaging by Collabora, and distribution by Apple. LibreOffice for Mac will continue to be available for free download directly from the LibreOffice website, along with versions for Windows and Linux.